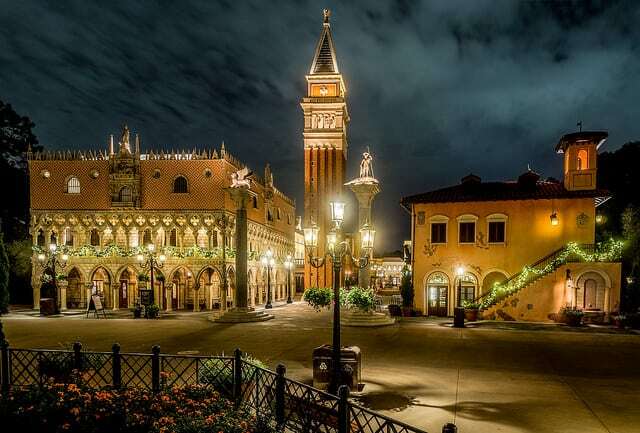 The Epcot Italy Pavilion in World Showcase is one of the most beautiful in the park. The attention to detail is spectacular. The pavilion is one of the smaller countries in Epcot, but you should make sure that you spend some time there. Epcot Italy is one of the quieter spots in World Showcase. Unfortunately, there isn’t an attraction, but the atmosphere, shopping and restaurants make this a great place to relax and simply enjoy the surroundings. 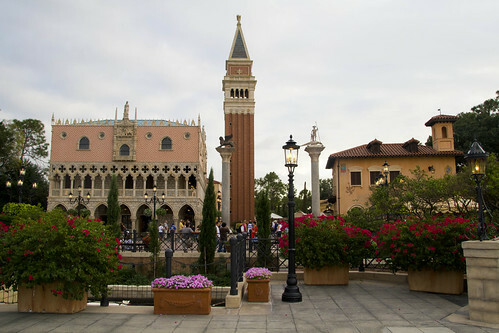 The Epcot Italy Pavilion has a reproduction of St. Mark’s Square which is at the center of the space. 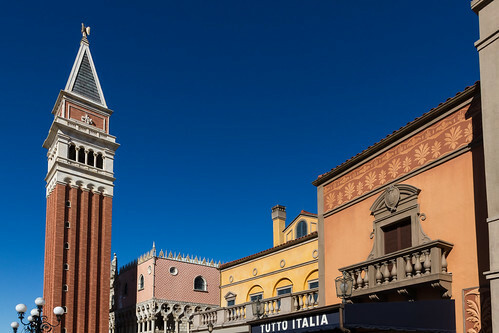 As you approach Epcot Italy you will see the huge 83 foot tall Campanile di Piazza San Marco. The Imagineers used a lot of artistic license in the placing of the buildings. However, this is meant to be a representation of Italy. It does a very good job of capturing the historic and grand feel of the architecture of Venice. 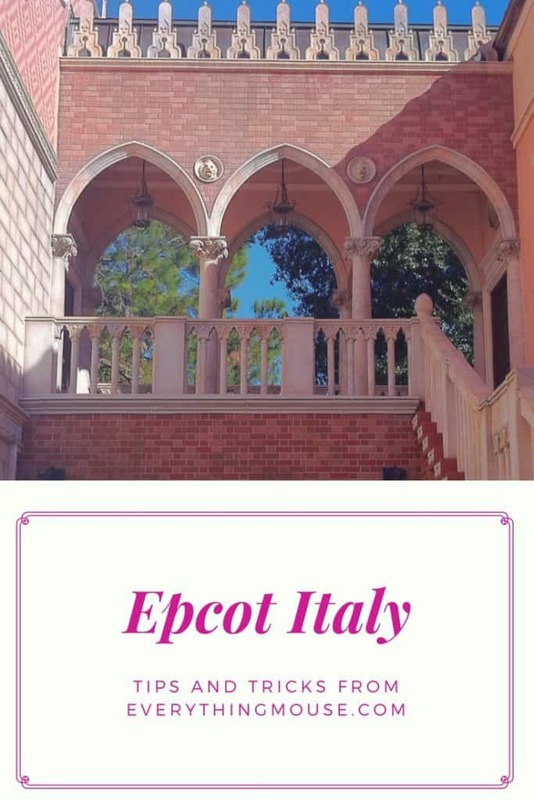 The main pink building in Epcot Italy is a replica of Doges Palace in Venice. The Imagineers wanted things to look as authentic as possible. The structure is made of fiber glass, but it has been painted and treated to look like marble. If you look right to the top of the bell tower you will see a statue of an angel right at the top. It is too far away to really appreciate, but this statue is covered with gold leaf. There are many great spots to take photos in the Italy Pavillion in Epcot. Another favorite place is the replica of the Neptune Fountain which is towards the back of the square, beyond the KidCot stop. It is worth spending some time watching the live street performers or listening to the singers Live street theatre and the singers “I Cantanapoli”. 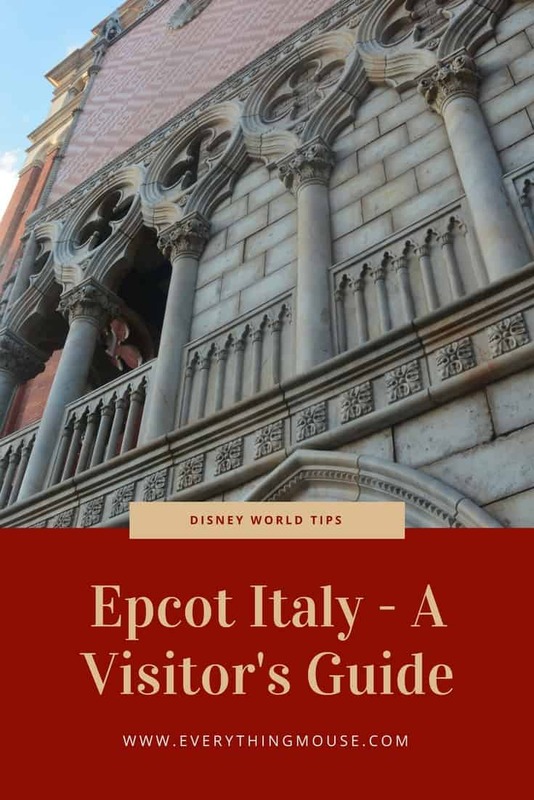 Remember to look at the very front of the Epcot Italy Pavilion at the edge of World Showcase Lagoon. There you will see a collection of replica gondolas just like the ones that are used in the Canals of Venice. This is a nice place to spend a few minutes and look over the Lagoon. It is also a great place for photos. Italy is of course known for its wonderful cuisine. As you would expect, there are some good Epcot Italy Restaurants. It now has two full-service restaurants to choose from, as well as a small wine cellar. 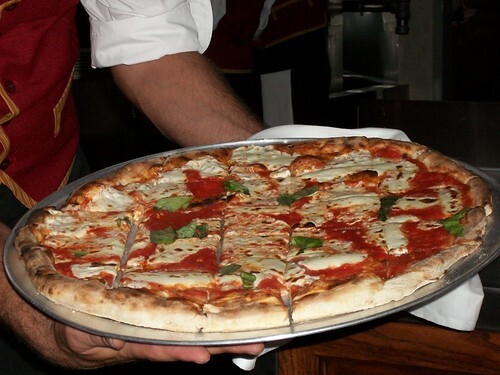 Via Napoli serves traditional southern Italian cuisine. The interior is spacious and welcoming. There is an open kitchen so that you can watch the chefs at work. There is a good selection of pizzas. Most of them are available in 3 different sizes so are perfect for sharing. Our pick always has to be the classic Tiramisu. 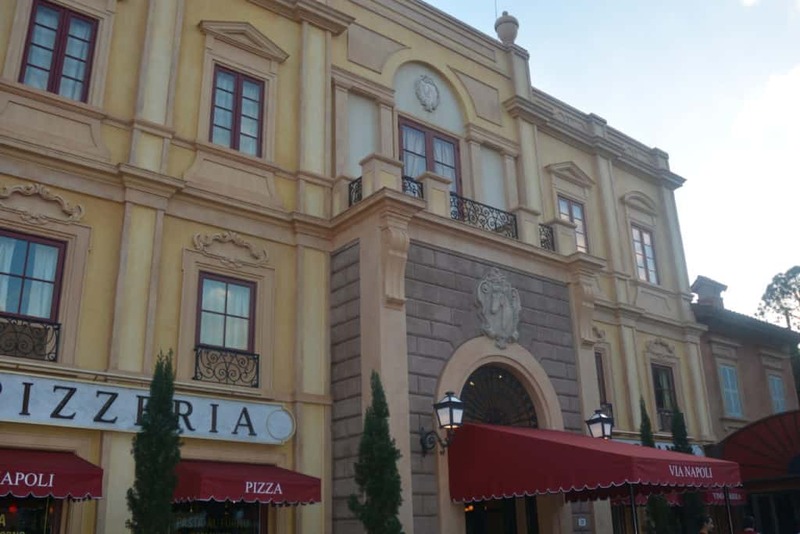 The Epcot Italy Pavilion has two full-service restaurants. Tutto Italia is the slightly more upscale venue of the two choices. There is a large dining room which is filled with lots of authentic Italian decor. The huge murals on the wall add to the sense that you are dining somewhere in Italy. If you possibly can, request a seat out on the piazza. We much prefer the ambiance out here and of course, you can enjoy some people watching whilst you have your meal. The Panini Menu is only available for lunch. 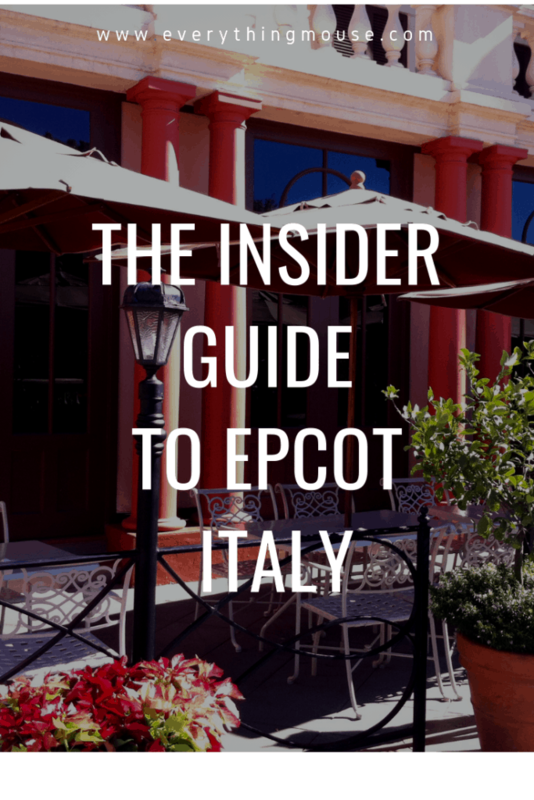 We highly recommend the Epcot Italy wine bar. 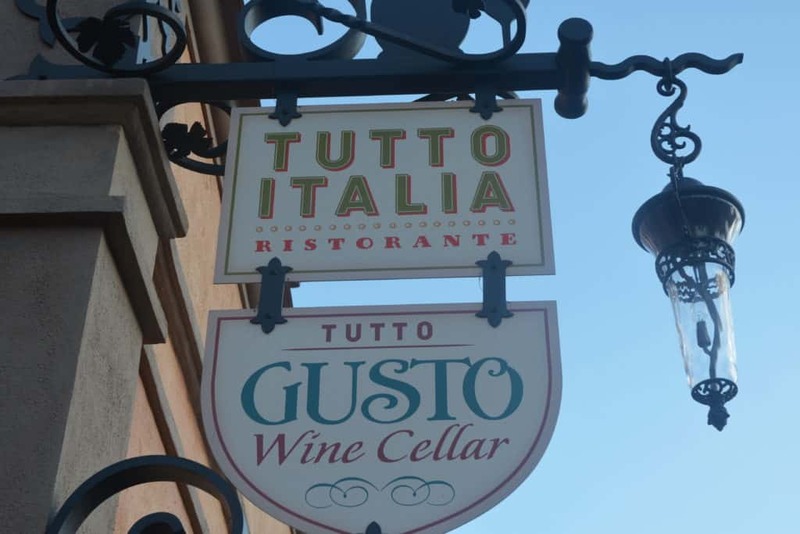 If you want to drink a great glass of wine and enjoy some small plates you should check out the Tutto Gusto Wine Cellar. Surprisingly this delightful venue is often overlooked by visitors to Epcot Italy. 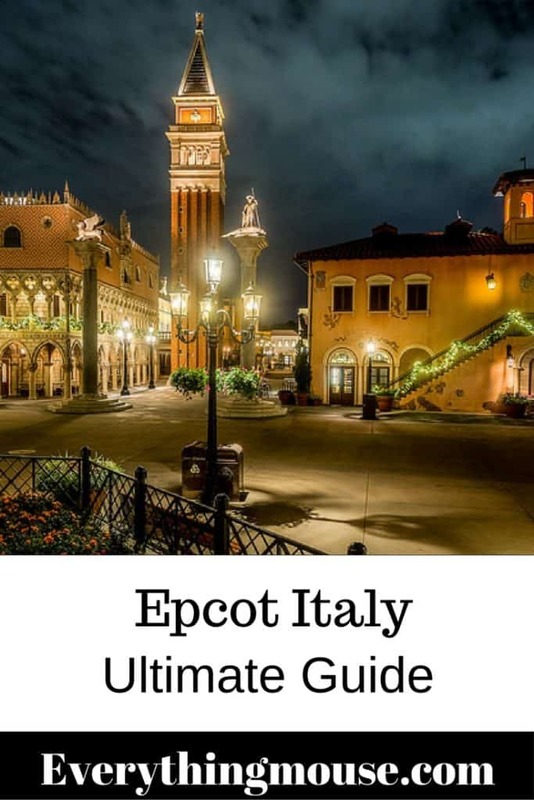 This Epcot Italy Wine Bar is a great place to spend some time and enjoy some downtime and rest your tired feet when you are visiting World Showcase. There is a choice of over 200 bottles of Italian wine at the Epcot Italy Wine Bar. The atmosphere is casual and relaxed. The setting is reminiscent of a small Italian wine cellar. You can enjoy wines by the glass or the bottle. There is also a Grand Tour Wine Flight available for $30 which includes six 2oz pours for you to sample. Specialty cocktails and beer are also available. The Tutto Gusto Wine Cellar also serves food. Unfortunately, they do not participate in the Disney Dining Plan. This is definitely a place that we recommend even if you are not on the plan. You can also choose a Panini for $8.00 to $14.00 with a selection of cheese and meat fillings. A visit to Epcot Italy would not be complete without enjoying some authentic Gelato. There is a snack kiosk called Gelati where you can enjoy this purest of Italian indulgences. They also serve a Gelato Sandwich if you like your ice cream in a chocolate chip cookie dessert. We also recommend the Cannoli and Tiramisu. You would expect the coffee to be great from the Italian Pavillion in Epcot, but unfortunately it really isn’t that good. There is often available seating close to the Neptune Fountain. It is good to sit there and enjoy a snack and some people watching. Il Bel Cristallo is the pink building located on the left-hand side as you stand in front of the Italian Epcot Pavilion. This has clothes, perfume, jewelry, and bags. 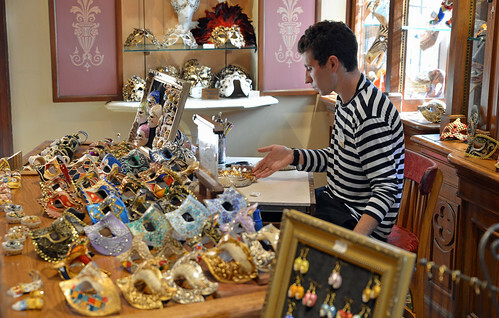 Our favorite section is at the back of the store with the display of authentic Venetian masks. Everything in the store is authentically Italian. Some of it is a little pricey, but you are sure to be able to find something that you like. The other store is La Bottega Italiana. This has a lot of very tempting kitchen items. The prices are pretty reasonable and you will find some things that you can’t buy anywhere else. There is also a large selection of wine on sale. You can sample some of them in their wine tasting selection. 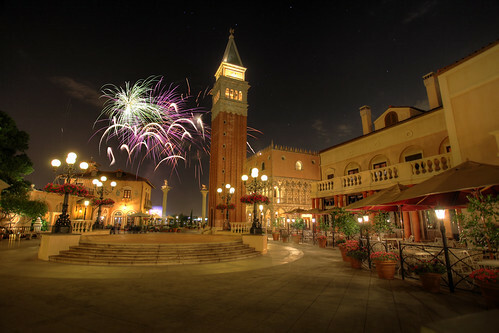 The experience of Epcot Italy is very different at night. When the sun goes down you can see very different elements of the architecture. Epcot Italy used to be a great place to watch the Epcot Illuminations. Unfortunately, these days the best spot, which is close to the gondolas on the Lagoon, is now used for Illuminations dessert parties or wedding parties. 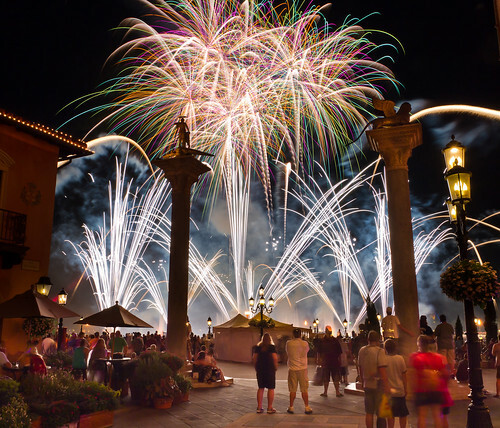 The space between Italy and America on World Showcase Lagoon is still a good place to watch Epcot Illuminations. As always, get a spot early and make sure there aren’t any trees blocking your view. 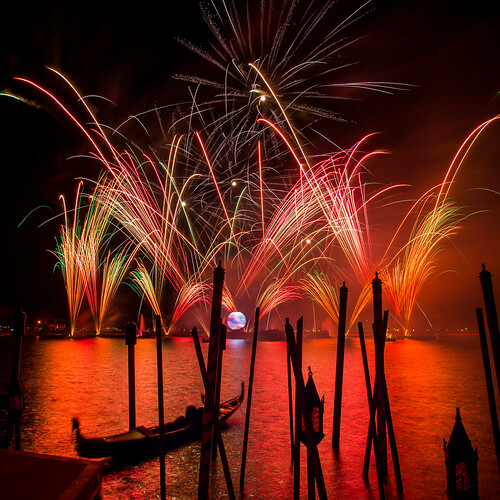 If you have seen Illuminations before and want a very different viewpoint, but you aren’t worried about missing all the action on the Lagoon itself, Italy is a peaceful place to watch away from the crowds. You won’t see all of the Illuminations fireworks but it can be a place away from the biggest crowds. 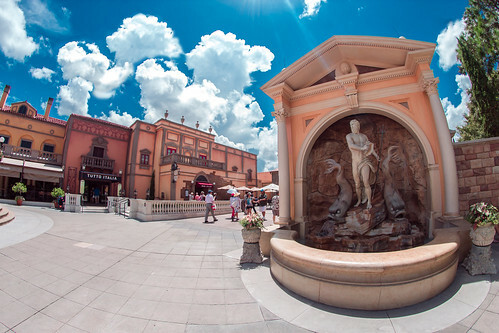 Epcot Italy is one of the most visually stunning of all of the Epcot Pavilions. It really does capture the feeling of this beautiful and historic country. Make sure that you make time to spend just simply taking everything in here. Sit and people watch in St Mark’s Square. Enjoy a gelato or a glass of wine. There isn’t an attraction here, but in some ways that is a good thing as everyone here is just visiting and passing through without a line to join. 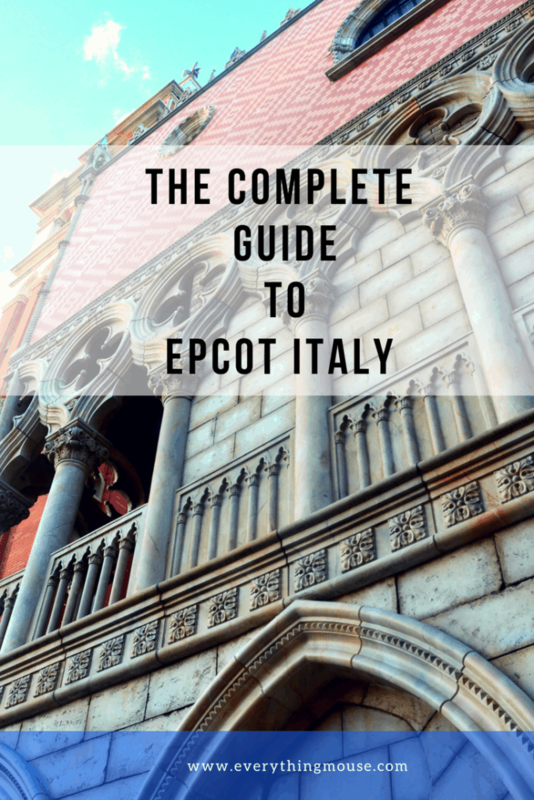 We hope that you enjoy Epcot Italy. Tell us what you think in our comments section.